We strive to provide the best camping experience for the children we serve, therefore we seek to choose the ‘best of the best’ volunteers for camp. Our volunteers are the ones who help make the ‘magic’ of camp happen. The applications become available in December and are due in March. 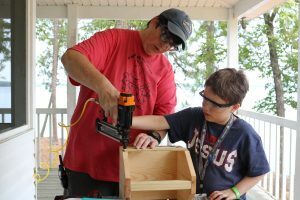 Cabin Counselor – Depending on campers needs, each counselor will be assigned to two to four campers for the duration of the camp session. You will sleep in the same cabin, provide guidance, safety, friendship and supervision. Activity Counselor – Instruct or assist in one of the many program activities offered during a session. You do not have to be an expert for this position. 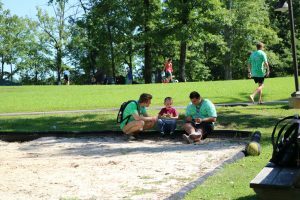 This position allows you to meet all campers and volunteers throughout the week. 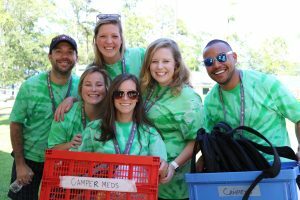 Medical Staff – Volunteer nurses and doctors that provide 24-hour health care to our campers and staff. Their job includes distributing medications and monitoring the health of all campers and staff. 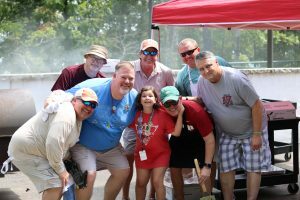 The doctors and nurses who attend camp are employees from Children’s of Alabama Hematology/Oncology Department. If you have questions after reviewing the volunteer information and application, please contact us. Interested in volunteering at camp but can’t commit to the whole weekend? We always welcome individuals and groups to come and volunteer for a day during camp sessions. Individuals typically come to speak about a topic or lead an activity. Speakers and Demonstrations: Whether you’re a motivational speaker or have something neat you want to show our campers, we’d love to hear your ideas!